In order to continue access for residents who use lower Coburg Road, a temporary single lane road will be constructed connecting Waegwoltic Avenue and Coburg Road. This road will be open during critical points of the project when access via Oxford Street cannot be maintained. The trail will be reinstated upon completion of the work to current urban trail standards. Please note, all dates shown are estimates. Project timing can be impacted by weather complications, and other factors. Advance notice will be provided prior to work getting underway. 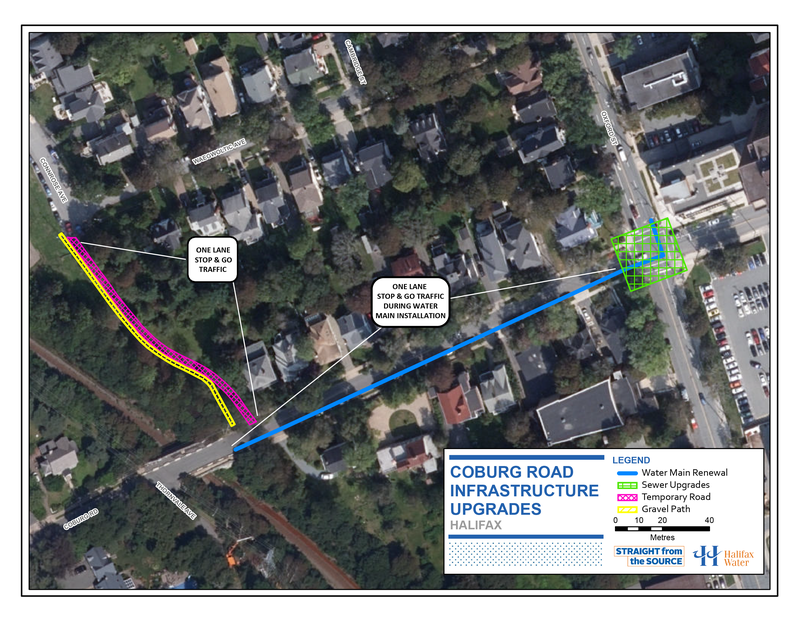 On February 20, 2019, Halifax Water held a Public Information Session at St. Mary’s Boat Club regarding the Coburg Road Infrastructure Upgrades project. Below is a summary of comments received from attendees. Halifax Water is reviewing the commentary and will be following up with residents prior to any work getting underway. The Connrose Right of Way (ROW) path is a heritage property and part of the city’s history. Its landscape, charm and appeal to residents cannot be restored. Environmental impact is a concern. What would the restored Connrose ROW pathway look like? Can aesthetic improvements be done to the Connrose ROW pathway after completion of the work (horticulture/planting)? Show explicitly what trees and limbs will be cut down or pruned. Concerns about water ponding at Connrose Avenue end of the pathway. A trail width of 3.0 metres is too wide. Doubtful the temporary road via Connrose ROW path can be built quickly. What can be done to prevent cars from driving through the trail once the work is complete? Concerned that HRM Active Transportation trail has not been vetted with community and this is allowing the city to get in without consultation. Connrose Avenue has no sidewalks. Very busy with children in playground. Delineation of vehicle/pedestrian space on Connrose Avenue. Can a protected sidewalk be constructed on Connrose Avenue? Concerned about driveway access for property at the corner of Waegwoltic Avenue and the Connrose ROW path. Legal and illegal parking issues on Beech Street and Cambridge Street. Can parking be reduced on local streets during interim traffic plan? Are traffic patterns being changed? Can other traffic controls be put in place to improve access to Oxford Street and Jubilee Road during the project? Can the infrastructure being installed at the intersection of Oxford Street at Coburg Road be modified to prevent the closure of Coburg Road and maintain a traffic laneway adjacent to the excavation to allow for traffic to enter and exit. Consider access through Thornvale Avenue and Webster Terrace as an option. If not an option, clearly outline why. Confirm if Thornvale Avenue a public road/Right of Way or a private road? If there is a plan to replace the CN/HRM bridge on Coburg Road in 2020, how is HRM planning to access the area for residents during that work? Confirm cranes cannot be brought through Thornvale Avenue. Confirm the CN/HRM bridge on Coburg Road cannot handle the weight of required project equipment. If the weight restriction on the CN/HRM bridge on Coburg Road can not handle the heavy equipment needed for project, the equipment should be brought in at the top of Coburg Road in advance of the closure and then taken out. Use temporary road on Connrose Avenue for truck traffic, Thornvale Avenue for car traffic. Programs start in mid-May and the first pool opens May long weekend. Concerned they will lose members due to the inconvenience. Starting project a few weeks earlier would mean less Waegwoltic traffic. What can be done to start and complete construction sooner? Can more protection be added to the temporary water mains to allow construction to start earlier in advance of Waegwoltic Club opening? Getting deliveries to the Waegwoltic Club is a concern. Can there be a drop-off for the Waegwoltic Club at the St. Marys Boat Club? Is there a potential for paving Waegwoltic Avenue and Connrose Avenue after the work is complete? Have another Town Hall type meeting which involves HRM Traffic and Trails staff, Waye Mason and Halifax Water. Halifax Water project staff followed up on the issues descibed above and met again with community representatives on March 26th, 2019 to provide a further update on the main concerns expressed by the community. This information was included in a Community Update distributed to residents and stakeholders on April 16, 2019. HRM did not approve a detour through Thornvale Avenue as route limits fire equipment access to the bottom of Coburg Road, which is not acceptable to Halifax Fire Services; Thornvale Avenue is private property, as such HRM has no ability to implement and enforce restrictions (ie. no parking). Two trees will be removed (near Coburg Road) along with trimming of low hanging branches on the trees nearest to Coburg Road and Waegwoltic Avenue; 12 new trees will be planted at the end of the project; HRM Urban Forestry will monitor all tree removals, trimming and replanting; the fork at Coburg Road will be maintained; traffic control staff will operate the temporary road 24-hours a day while in use. Outside of these hours, the detour will be managed through automated, timed traffic lights that are monitored by the contractor. Final trail restoration will be as directed by HRM’s Active Transportation Department. From April 22 – May 31, there will be no parking anytime in the following locations: east sides of Beech and Cambridge Streets; south side of Geldart Street; Connrose Avenue adjacent to the park. During construction there will be no parking on Coburg Road between Oxford Street and the CN Bridge. While the temporary Connrose right of way path is in use, there will be no parking 7:00 AM - 7:00 PM in these locations: west side of Beech and Cambridge Streets; north side of Geldart Street; Waegwoltic Avenue. There will be no changes to existing Waegwoltic Avenue travel restrictions. Fencing will be extended for a limited distance along Connrose Avenue to keep pedestrians and cyclists separate from vehicles as they exit the temporary road. Contractor can provide traffic control personnel after hours in the event of a function at the Waegwoltic Club; Club has been made aware of pick up and drop off option available through parking lot at St. Mary’s Boat Club.